There has been a lot of chatter in Facebook Groups and SEO forums of websites losing 20-30% traffic. If you have clients or websites you own that have lost 20-30% recently, the Google Maccabees update may have hit. Barry Schwartz over at SERound table has been gathering data and examples from kind and sharing SEO’s to analyse this update which has been coined the ‘Maccabees’ update by Barry himself. With over 100 sites now reviewed that have been hit by the update it seems the culprit for this is websites with multiple page targeting many keyword permutations. Targeting multiple keyword permutations on different pages is an old tactic but still used a lot today in travel, real estate, e-commerce and affiliate websites. It used to work particularly well to catch all the variations/permutations of keywords in the longtail. Having a page dedicated to a longtail keyword would give it preference in search results. Multiply this across all the keywords in your industry and you could mop up on the relatively easy and high converting keywords. This is a terrible user experience. The pages targeted in this update will be low quality, thin, and built for search engines. Unless there is a very good reason for separate pages for each keyword, you shouldn’t load your site with these low quality pages. Some websites like the screenshot above, have very good reason to have a page for each location or permutation. 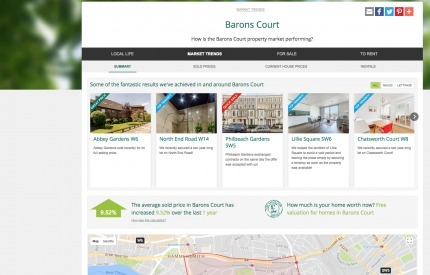 The website in question above shows maps, average house prices and unique local info on each page. It os not just a thin page designed to catch visitors from search, there is value on the page. If there is no opportunity for value for your website or your clients website when looking to target permutations, consider a different approach. Use one page to target multiple similar keywords. This should be done within the keywords used on the page. But don’t worry about getting robotic about this and targeting each keyword permutation within the text using densities and keyword stuffing. By all means, use keyword tools, but write for humans first and foremost. Google is very good at figuring out searchers intent, and it’s getting even better. You don’t have to have the exact keyword text on your page to have it rank and be exposed to searchers. Could all be targeted from one page. This is a much more evergreen and user friendly approach and mindset that will give your website more longevity. If you have a high authority and well loved site, it shouldn’t be a problem ranking a page for the permutation keyword traffic you were ‘hacking’ from separate pages. If you are targeting locations, consider listing these, but do you really need a low quality thin page for each one? We hope this helps, we will keep this page updated with more as we find out!